It was my first time. It took some getting used to, but ultimately I must say I'm super happy with the results of that, and the resulting normal maps that I could make. All that's left to do now is rework the diffuse maps a bit and then get around to sculpting all the rest of the cliffs. The challenge at the moment is the tiling aspect. With the normal maps in the mix it's difficult to control at the moment particularly along the lines of the cliffs itself. If it does appear very obvious I'll have to think of something. But other than that it's all lovely. 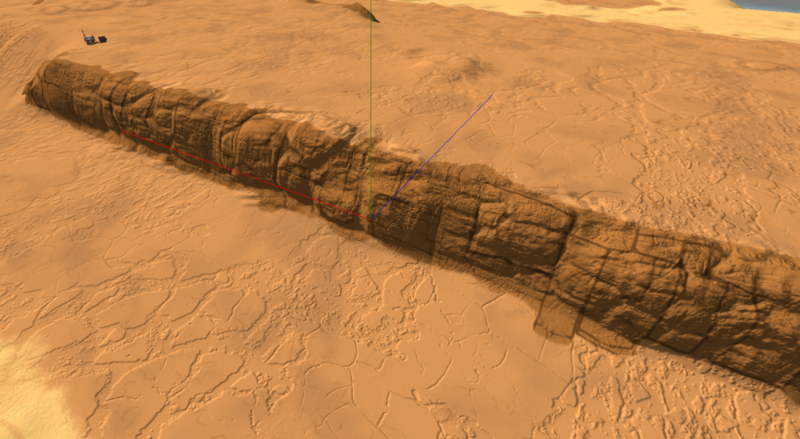 Update Here's an updated screenshot of the cliffs with a new diffuse texture. You'll notice that the ground and cliff colours are all a bit more de-saturated and lightened. This was thanks to my wife's suggestion since she didn't think the colours matched. So with the submission deadline for Indie Cade coming closer, I've spent some time polishing up the game. And fixed a lot of bugs. And worked some more on the effects, specifically for night time.